UK’s Whitbread Plc investors got a caffeine high on Friday, what with its shares rising 14% in London. Investors are seemingly thrilled that Coca-Cola Co. will purchase Costa Ltd, Whitbread’s wholly owned coffee arm, for an enterprise value of $5.1 billion. This translates into about 16 times Costa’s FY18 Ebitda (earnings before interest, tax, depreciation and amortization) and is a surprisingly big premium, analysts have reckoned. As consumers become health conscious and carbonated high sugar drinks become less fashionable, it makes sense for Coca-Cola to look towards healthier options. “Coffee helps us get into hot beverages," said James Quincey, president and chief executive of Coca-Cola, adding, “Coffee is one of the fastest-growing beverage categories in the world, at 6%." In May, Swiss-based Nestlé SA agreed to pay $7.15 billion to Starbucks Corp. for exclusive rights to sell the latter’s packaged coffee and tea products across the world. Globally, coffee is becoming hotter, as consumers are willing to pay a premium for exotic brews. Back home, Coffee Day Enterprises Ltd’s investors too cheered the development, taking the stock up by 6% on Friday, a dull day in the Indian equity markets. Coffee Day Enterprises is the holding company involved in the coffee business, apart from logistics, financial services, commercial leasing space, hospitality services, and investment and other corporate operations. The coffee business revenues account for almost half of the company’s overall business. Investors hope that such deals (Cola-Costa, etc.) will lead to a rerating of firms in the same kind of businesses. 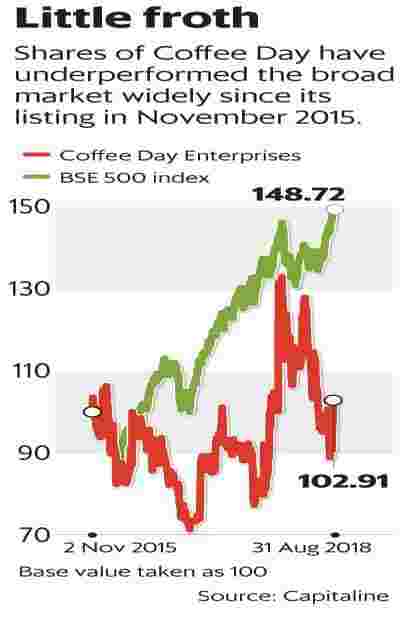 But the excitement may be short-lived for Coffee Day Enterprises investors. Sentiment hasn’t been the best for the company. Its Cafe Coffee Day (CCD) outlets seem to be suffering from a perception problem. Also, apart from competition from other coffee chains, CCD has to deal with competition from tea outlets such as Chai Point and Chaayos. It is also worth remembering here that Coca-Cola is also betting on the vast potential in China where Costa has 449 stores (total store count: 3,821), which can probably justify the high valuations it is paying. Sure, Coffee Day Enterprises’ Cafe business has done well in recent quarters. Same-store sales growth increased 8.2% and 10.4% in the March and the June quarters, respectively. Average sales per day have seen a modest increase sequentially in the last two quarters. Nonetheless, even after Friday’s jump, shares of Coffee Day Enterprises are 8.4% lower so far this fiscal year. In fact, currently, the stock trades at ₹ 278, much below its issue price of ₹ 328 in November 2015. Essentially, its holding company structure and presence in many businesses (leading to investors assigning a conglomerate discount) is a reason for the underperformance. High debt is a problem too. The total consolidated debt at June-end was ₹ 3,500 crore, pointed out a report from KIM ENG Securities India Pvt. Ltd on 29 August. Its current market capitalization is ₹ 5,873 crore. The company aims to reduce at least half of the debt at the holding company level via a stake sale in one of its subsidiaries/associates by the end of this fiscal year, added the report. Progress on this would be key for the stock outlook.